Round sterling silver shadowbox post earrings with stamping and a free form turquoise stone. They measure approximately 3/4" in diameter. 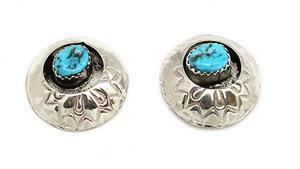 Handmade by Navajo artisan Lenatte Largo. Size and shape of stone will vary as well as stamping.